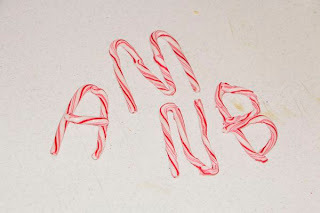 I am not sure why, but my girls love candy canes! I am guessing it is their interesting shape more then anything. Although I suppose being made of sugar helps some too! 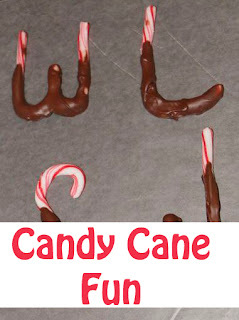 I have seen people all over Pinterest bending their candy canes into shapes, so I thought I would try too. 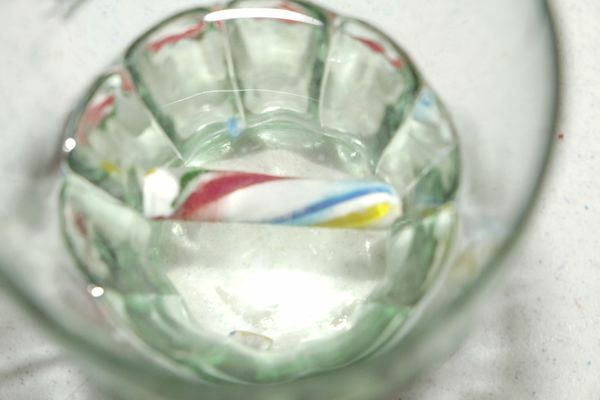 I figured the little candy canes would be easiest because they are small, so they should heat up quickly. I didn't even consider it might work the opposite way, and they would cool down just as quick! 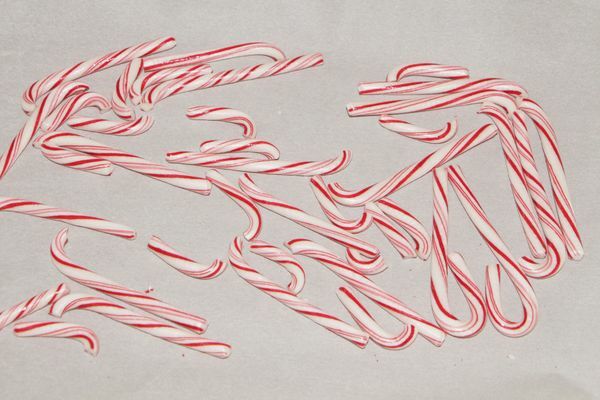 So I started with a 300 degree oven and a bunch of little candy canes. I wanted to turn them into letters. I baked them for 4 minutes and they were hot! Too hot to handle! I let them cool a bit and was able to start forming some letters. They cooled to fast though and had to be returned to the oven. This time for just 3 minutes. After that I was able to make a couple more letters. Again the candy canes would cool off and have to go back in the oven. 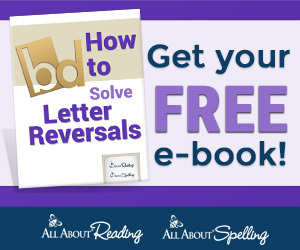 I think I repeated this 6 times and still didn't have all my letters! Talk about frustrating! 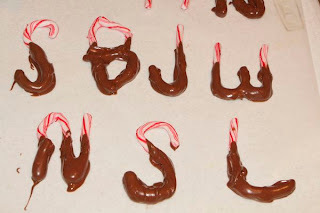 My letters were also not smooth and pretty likes the ones I had seen. They were all smushed where I tried to join them. Especially when they got hot and melty. So I decided to dip them in chocolate. Chocolate makes everything better, especially peppermint! I did discover that if you lift them when the chocolate is almost dry you get much nicer edges! I had hoped the girls would be able to play with the candy canes like they did on Preschool Powol Packets, but these little ones got too hot and just didn't work well. We may have to try some of the big ones we have! 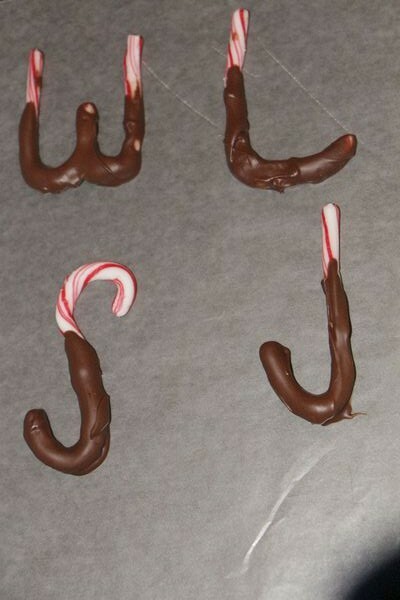 While I was messing with the little candy canes I let the girls do a different experiment with a big cherry flavored one. 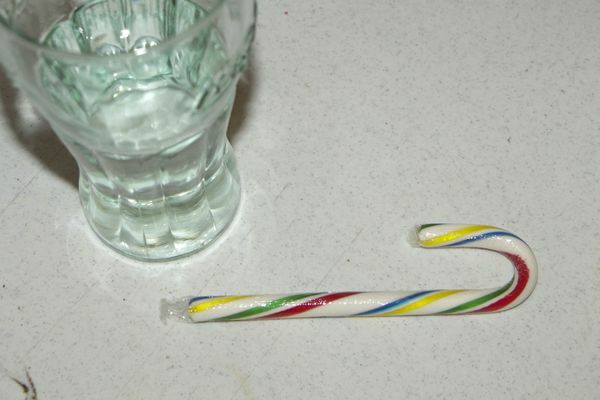 We have previously placed Skittles in water to see the S's come off, so we did the same with the candy cane to see what happened to it. Bria predicted the stripes would come off. And almost immediately the stripes started getting fuzzy. 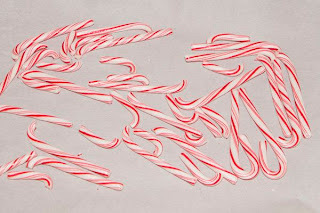 The girls ran off for a few minutes, and when they returned not only were the stripes gone, but most of the candy cane piece! All that was left was this little sliver. Bria stuck it back in and waited a few more minutes. It was gone! 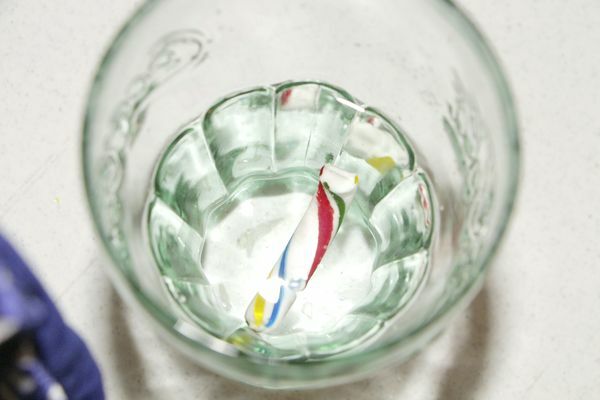 Completely dissolved! At this point the girls insisted the resulting greenish water would now taste like the candy cane, so I let them try it. They both willing tried it, but neither of them thought it had the same cherry flavor! Next time we will try the big candy canes for sure, but at least you don't have to experience the same frustration!